Quietly, away from the TV cameras, with a little help and a lot of hope, families in Iraq are starting to come home, rebuild their lives and create a future free from poverty. 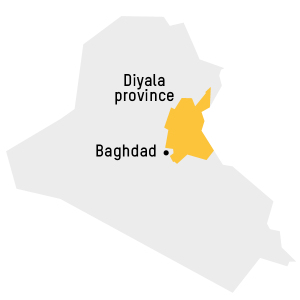 Diyala straddles the part of Iraq where the self-governing Kurdish region meets the rest of the country. Parts of the province were occupied by Isis, then retaken by force. When the dust had settled, a region famous throughout the Middle East for its juicy oranges lay broken, ruined and largely empty. The economy had seized up. The water-supply network was smashed. The schools were closed. Many people had fled. Poverty gripped the lives of everyone still there. 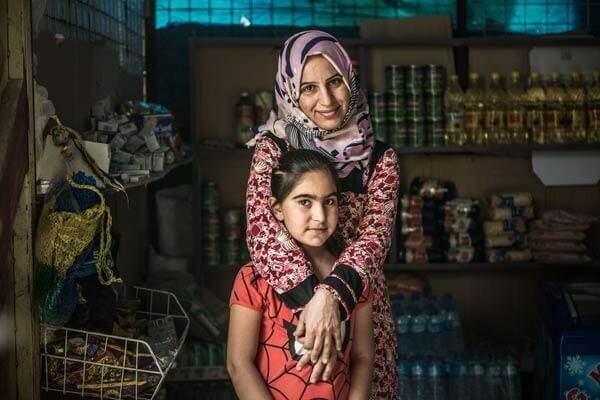 Somehow, through all of this, mothers like local shopkeeper Nadi and tailor Zahia never lost hope of rebuilding their lives. What would your hopes be if your life had been destroyed, and you were trying to put it back together again? For Nadi Hassan, hope is having a home. Hope is caring for her family. Hope is earning a living from her shop. 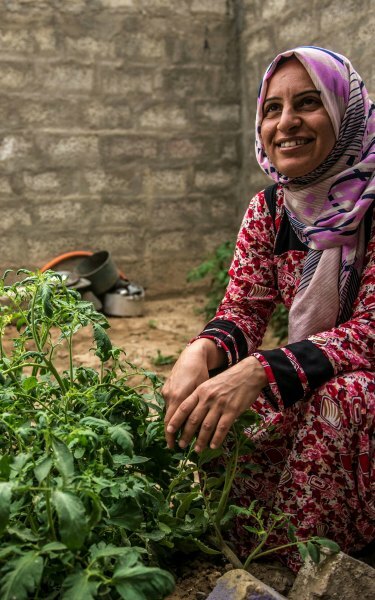 Hope is growing tomatoes in the garden of her house in Diyala province, Iraq. You see, just staying alive in this part the world has been hard. Hard even by Iraq’s recent standards. It has been especially hard for Nadi since her husband was murdered by unknown gunmen, leaving her widowed at 21 with children to raise and a shop to run. But somehow, she kept her business afloat. Somehow, she and her children got by. But when Isis came to Jalawla town, Nadi couldn’t hold on any longer. 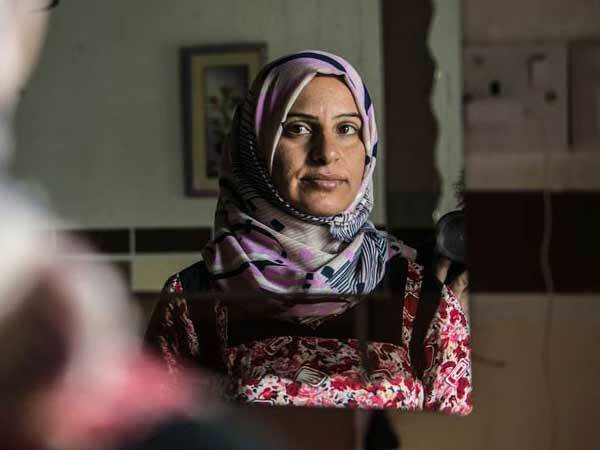 When she first saw the tanks, she took her children and fled. She left behind her home, her shop and her beautiful garden. Homeless, afraid, cut off from her livelihood with a family to support, she longed for peaceful comforts like the fragrance of fruits and vegetables as she tended the plants in her garden. But Nadi’s family weren’t the only ones forced to leave. People were fleeing Isis all over the region. 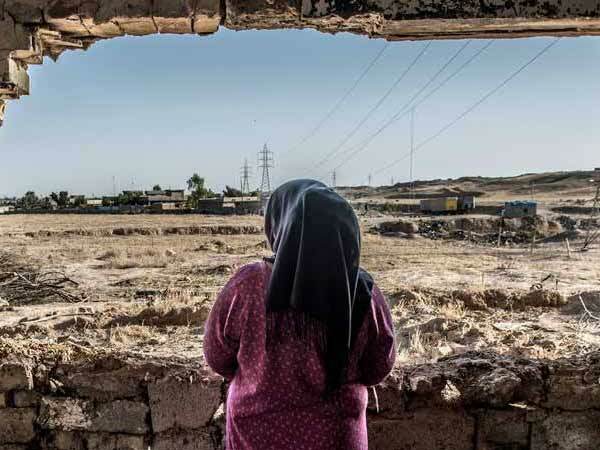 Even when Isis took her house, Zahia never gave up hope of making it her home again one day. Zahia was visiting a nearby town when Isis turned up at her family’s home on the edge of the village. Her brother mistook them for peshmerga soldiers and began speaking to them in Kurdish instead of Arabic. They were furious. As they forced him to kneel with a gun to his head, Zahia’s sister begged for his life. Somehow, miraculously, the fighters didn’t shoot him. But they ordered the family to leave, immediately, with no time to collect belongings. Suddenly they were homeless, and penniless. That is how quickly lives can fall apart in Iraq. Speak to anyone in this part of Diyala province and they’re likely to have terrifying stories like this to tell. In Jalawla, in Husseini, in Saadiya, ordinary people with little to begin with were forced out of their homes with nothing. Qassim the barber. Yusset the shopkeeper. Rafd and Muhamed the water engineers. People ended up many miles from home, living in chicken coops, in barns, in abandoned buildings, with no money, no facilities, no livelihoods. But at least they were alive. At first Nadi and her family stayed in a camp in a football stadium, then moved to a half-finished building with no electricity or running water. The sound of air strikes terrified her children in the night. Determined to keep them in school even while they were homeless, Nadi earned a little money here and there from making chips and desserts to pay for their tuition. It was so hard, but she never gave up. ventually Isis were driven out, but when people started to return they barely recognised their own homes. Nearly everything in Nadi’s house was broken, burned or stolen. Roofs had collapsed. Walls had crumbled. It was filthy. But she was home. She was home, but now she had to work out how to rebuild her house and make ends meet. For Zahia’s family, returning home to Husseini was too painful, and they had started new lives in Kirkuk. But as a divorced woman with a son to raise on her own, Zahia didn’t have many options. Besides, she remembered happy times in Husseini, laughing at jokes and telling silly stories. Drinking tea and eating cakes. Earning her own living as a tailor, visiting housebound women to make their clothes for them. So she decided to go home. It was a brave decision. When she arrived, she must have wondered if she had made the right choice. Half the house was gone. The other half was wrecked, the walls burned black with scorchmarks and peppered with holes. There were lethal explosives buried in the garden. She hated the thought that Isis had been using her house, but she was determined to make it her home once more. She found one photograph of her brother, and a kitchen sideboard that hadn’t been destroyed. She wrapped them in plastic to protect them from soot, rolled up her sleeves and got to work. But if it took invincible hope for women like Nadi and Zahia to return home, it would require lots of practical help before they could rebuild their lives. During a rise in violence in the summer of 2014, Oxfam staff carried out a major assessment to find out what would help communities in Diyala recover and rebuild. The answer came from people like the Mayor of Saadiya, Ahmed Thamer Ali: Let’s make this a place families want to come home to. Let’s give them hope that they can live here and be happy again. So to help people reopen their businesses, rebuild their trade and give the local economy a much-needed kick-start, Oxfam gave small cash grants to help people buy sewing machines, barbers’ equipment, delivery tricycles and other portable means of making a livelihood. In Jalawla, we gave shopkeepers like Nadi money to repair and restock their shops. It took her two months to clean her home and start trading again, but she got there. Now people send their children to her shop to buy things, because it’s local and they trust her. No-one would claim that life is easy for Nadi or Zahia now. Iraq is still unstable, and as single mothers they face difficulties just going about their daily lives. But they’re home, and they’re earning a living. They’re providing for themselves and their families, and they’re helping their communities return to normality. And she can plant seeds in her own garden, tend her plants in peace and look forward to eating the tomatoes she has grown. A simple pleasure, made possible by hope. Oxfam is providing emergency shelter and supplies for people forced to flee the recent fighting in Mosul, but we also work with local partners to ensure that families who are starting to rebuild their lives have clean water, habitable homes, schools for their children and a way to earn a living.